If you have ever wondered how your local county elected officials make decisions and how the government is managed, Supevisor Brown encourages you to attend a Yavapai County Board of Supervisors meeting! What does a Yavapai County Flood Control District Hydrologist do???? Arizona's 32nd Annual Statewide Transit Conference presented by AzTA & ADOT! Yavapai Regional Transit (YRT) was recently awarded the 'Outstanding Rural Transit System of the Year' by the Arizona Department of Transportation and Arizona Transit Association. Congratulations Yavapai Regional Transit. Your many years of hard work, fortitude and determination has earned you respect and recognition in the transit world!!!! Please be advised that Asphalt Paving and Supply, in conjunction with Yavapai County, will be performing chip seal and fog seal operations on various roads and neighborhoods in Yavapai County. Construction areas include Chino Valley, Cordes Lakes, Lake Montezuma, Mountain Club, Rancho Vista, Ash Fork, and Seligman. Construction work will include placing a 3/8â€™â€™ chip seal, fog seal and striping on various roads in those areas. Construction will begin Monday, April 15, 2019, and continue through Wednesday, June 5, 2019. One lane of traffic will remain open at all times; however, motorists may encounter lane restrictions, reduced speeds, and flagging operations throughout the work zones. Motorists should expect minor delays and allow extra time to get through the construction areas. Please follow all traffic control devices when travelling through the work zones. The circus is coming to Paulden.....!! SAVE THE DATE! April 18, 5:00 and 7:30 p.m. The circus will be in town. Tickets go on sale soon! Watch Facebook for details on where you can purchase tickets or call (928) 899-1838 for more information. This is our fundraiser for the year and it's a lot of fun! If you'd like to volunteer to help sell tickets, please call the above number. The Paulden Library offers copying, printing, faxing, scanning and free notary service. Clean up is open to all Yavapai County residents at no charge and transfer stations will remain open on Tuesday and Wednesday with normal hours and fees. * LOOSE TRASH WILL BE REFUSED!!! The Yavapai County Board of Supervisors is pleased to announce the continuation of the annual free slash drop-off program at County transfer stations beginning April 1, 2019 through June 1, 2019. This free slash drop-off program will assist residents in creating defensible space around their homes and other structures. Cutting away vegetation 5 to 30 feet from all structures and removing all debris and dead vegetation from roofs, decks, and the ground can reduce the potential of a wildfire spreading to your home. Please take advantage of the free slash drop-off program as you create defensible space around your properties. Only the following items will be accepted: brush, branches, grass, leaves and yard trimmings. Items not accepted are: lumber, stumps, roots, cactus, metal and garbage. All slash must be removed from plastic bags. Please be advised that Earth Resources Corporation in conjunction with Yavapai County will be performing roadwork on Marblehead Avenue in Paulden. Old Chisholm Trail in Prescott County Club, Diamond Drive, Butterfield Road and various roads in the Wildwood Neighborhood in Prescott. Construction will begin March 25, 2019 and continue through May 23, 2019. Road construction will consist of asphalt overlays, shoulder work, guardrail installation, new striping and miscellaneous concrete work in a few areas. One lane of traffic will remain open at all times in all areas; however, motorists may encounter lane restriction, reduced speeds and flagging operations throughout the work zones. Motorists should expect minor delays and allow extra time to get through the construction areas. Please follow all traffic control devices when travelling through the work zones. For additional information, please contact Yavapai County Public Works at 928-771-3183 or visit us on the web at www.yavapai,us/public works. A 10-month project to replace the bridge over Meath Wash in Yavapai County is set to begin next week. 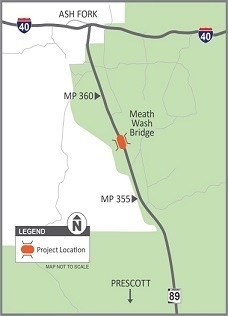 The Meath Wash bridge is located on SR 89 south of Ashfork near milepost 358. The north-and southbound shoulders of SR 89 will be closed. The speed limit in the work zone will be reduced from 65 mph to 45 mph. The bridge will close in early March and remain closed for about six months. A temporary detour around the existing bridge will be constructed to maintain one lane of traffic in each direction at all times while bridge-replacement work is underway. ADOT crews will remove and replace the existing bridge with a new cast-in-place two-span bridge and improve sight distance from the travel lanes at this location. Drivers are asked to obey traffic control devices and use caution around construction personnel equipment. PRESCOTT, AZ(January 24, 2019)—Prescott National Forest officials wanted to give folks a heads up that they have one more weekend for climbing opportunities before the Forest implements restrictions on climbing and other activities on the cliff faces of both Granite Mountain and Thumb Butte on Friday, February 1, 2019. Both sites have been consistently occupied by peregrines annually for more than 21 years. These annual closures are providing the undisturbed setting and quality nesting habitat essential for peregrines to successfully raise their young. The closures will begin February 1st and last until July 15th. For both locations, the closures will be the same as they have for over 20 years. On Granite Mountain, it is prohibited to be upon any part of the Granite Mountain rock cliff face or the rim above the rock face and extending 100 feet back from the edge of the cliff face by rock climbing or any other means of access. Trail 261 will remain open. On Thumb Butte, both the north and south climbing faces, the top of Thumb Butte, and the areas at the base of the climbing faces will be closed to entry. The Prescott National Forest would like to remind visitors that while our day-use facilities may be closed due to the lapse in government funding, the forest does remain open. These area closures for the peregrine do not impact or close any system trails; Trails 33 and 261will remain open for hiking. Maps of the closed areas will be posted throughout both the Thumb Butte and Granite Basin Recreation Area. The Prescott National Forest is asking local birders to share their field observations of peregrine falcons with our resource managers to provide a better picture of peregrine nesting progress. Please send observations, photos and information to Noel Fletcher at noel.fletcher@usda.gov. Peregrine falcons were once listed under the Endangered Species Act. They continue to be managed under the protection of the federal code of regulations as well as state and federal law. Land managers consider the needs of the peregrines and the recreation desires of people to strike a balance where both can effectively use the same space at different times for their respective purposes. Intermittent lane closures of east- and westbound I-40 are scheduled from 7 a.m. to 8 p.m. Wednesday, Jan. 8, and Thursday, Jan. 9. Detours: Traffic will be diverted to the Exit 121 on- and off-ramps for both east- and westbound traffic. The speed limit will be reduced to 25 mph through the work zone. East- and westbound I- 40 will be reduced to one lane between mileposts 120 and 122 (right lane closed) beginning Thursday, Jan. 10 and continuing through spring 2019. The speed limit will be reduced to 55 mph through the work zone. A 14-foot vehicle-width restriction will also be in place. North- and southbound left turn lane restrictions will be in place on State Route 89 and MacCurdy Drive. These turn restrictions are scheduled to remain in place through spring 2019. Drivers should consider alternate routes and allow plenty of extra travel time. Beginning December 1, 2018, prohibitions along the John’s Tank Trail will be enforced on the Prescott National Forest east of Lynx Lake. These prohibitions will protect the nesting bald eagles from the potential disturbance from human presence during the nesting season. While the John’s Tank Trail #94 will be closed to all uses, the Lynx Lake Shore Trail #311 and the Salida Gulch Trail #95 will remain open for their respective uses. These prohibitions apply to the approximately 1 mile stretch of the John’s Tank Trail that is east of Lynx Lake and connects the Lynx Lake Shore Trail to the Salida Gulch Trail. The prohibitions will also be enforced north and south of the trail between Lynx Lake and the Salida Gulch Trail. A map of the closure area will be posted at all trailheads accessing the area and well as on the Prescott National Forest website and the Bradshaw Ranger District office. It is prohibited to go into or be in the restricted area. 36 CFR 261.53 (e). It is prohibited to be on the trails in the restricted area. 36 CFR 261.55(a). Trail loop opportunities in other areas can be found on the adjacent Highlands Center for Natural History just north of Lynx Lake. The Prescott National Forest would like to thank the members of our community who brought this nest to our attention. We can all work together to be stewards of our natural resources. In the spirit of stewardship, observing the closure order is critical during egg incubation and the first six weeks after hatching. Any disturbance that causes the eagles to be off the nest for an extended period of time during these important stages of nesting could cause egg failure or death to young eagles that may be in the nest. For more information, please call the Bradshaw Ranger District at 928-443-8000 or go to http://www.fs.usda.gov/prescott for a copy of the Closure Order Number 09-237 and associated map. Access to Historic Route 66 along Interstate 40 at Exit 121 will close Monday, June 11, for a $4.3 million bridge project. 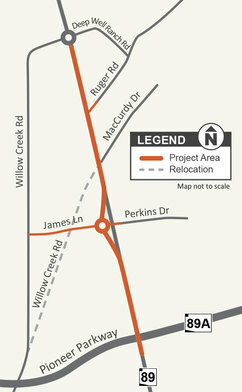 ADOT will replace decks on three bridges between I-40 exit 121 and the west side of Seligman. These bridges are between 40 and 50 years old, and the current decks need heavy maintenance. The second I-40 exit (Exit 123), which is about 60 miles west of Flagstaff, and route to Seligman’s east side will remain open. The project is scheduled to be completed in May 2019. Signs on I-40 will direct travelers to exit 123, connecting to the east side of Seligman. 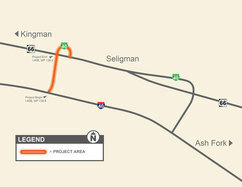 ADOT also has produced a brochure and video explaining the project and noting that visitors will be able to reach Seligman from I-40 throughout the project. The work on the West Seligman Bridges project is scheduled to begin in early June, 2018. ADOT has been working to provide many of the ideas developed at the April Business Workshop to the public. Suggestions were incorporated into their Project Deliverables prior to the start of construction, as well as signage and messaging during the construction phase. As ADOT moves forward with the West Seligman Bridges project, they want to provide you and your business with materials to use on your websites and in your outreach to those who may be looking to visit Seligman in the near future. The ADOT informational brochure-this will also be posted on the project website and hard copies available at ADOT Rest Stops and the Power House Museum in Kingman. In addition, below is the link for the video produced by ADOT Video Team which informs the public about the exit closing, bridges project and route to Seligman. This will also be posted on the project website and on YouTube. ADOT is planning to provide the information above to other State transportation and tourism outlets, but will not be able to provide this information directly to tour bus companies or other businesses that may provide services to your business. Please feel free to share all of the materials with them through your business website or other means.